Partner country representatives paid study visits to the EU partners, according to the plan. An examination of good practice models from EU was provided to the partner country representatives, who actively presented the local needs and the current status in Serbian HEIs. 1. 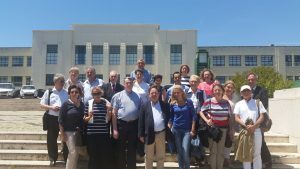 Visit to TUC, Chania, September 19-21, 2014. (18 participants from Serbia) In a three day program, staff from TUC gave an overview of the organization of doctoral studies. A fruitful discussion incorporating all partners was devoted to crucial aspects of organizing doctoral schools. 2. Visit to BOKU, Vienna, December 11-13, 2014. (20 participants from Serbia). In a three day program, staff from BOKU gave a presentation of the University and its doctoral study programs, with a special emphasis on doctoral schools. 3. Visit to UGent, Ghent, March 24-27, 2015. (20 participants from Serbia). In a very comprehensive and organized way, staff from doctoral schools from Ghent University gave a presentation of Doctoral Schools. Information covered not only academic aspects, but also organizational issues, important for administrative staff. 4. Visit to Lisbon University, Lisbon, April 26-28, 2015. (23 participants from Serbia) Presentation covered important aspects of doctoral studies with emphasis on joint doctoral degrees. The presentation was related to both academic and administrative aspects. Within all the above visits attention was paid to the main problems relevant for WP1: quality assurance standards and to funding procedures.